The Illinois Institute of Art-Chicago is college with 2322 students located in Chicago, IL. What are the top 3 reasons someone should attend The Illinois Institute of Art-Chicago? The three reasons someone should attend The Art Institutes is use some of the best equipment available to you, enjoy the hard working and caring staff and, study you area of interest. What is a typical The Illinois Institute of Art-Chicago student like? Describe the type of person that should attend The Illinois Institute of Art-Chicago. A student that should go to The Art Institutes is a creative, open minded, kind and hard working student. The Illinois Institute of Art -- Chicago is located in two facilities in downtown Chicago. 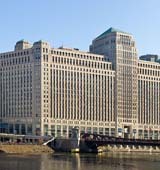 The larger of the two campuses is situated in the Merchandise Mart and the satellite campus is located on the corner of Lake and Wabash avenues and features the student-run restaurant The Backstage Bistro. The school offers the following Bachelor of Fine Arts degree programs: Digital Filmmaking & Video Production, Digital Photography, Fashion Design, Game Art & Design, Interior Design, Media Arts & Animation, and Visual Communications. We also offer Bachelor of Arts degree programs in Advertising and Fashion Marketing & Management, a Bachelor of Applied Science degree program in Culinary Management, and Bachelor of Science degree programs in Hospitality Management and Audio Production. Our Associate of Applied Science degree programs include Culinary Arts, Fashion Merchandising, Graphic Design and Web Design & Interactive Media. All of these programs are offered on a year-round basis, allowing students to continue to work uninterrupted toward graduation. The Illinois Institute of Art -- Chicago strives to provide quality higher education for students seeking careers in applied arts, media, and design professions. The curricula reflects both the cognitive and creative elements of the major disciplines integrated with a comprehensive general education program. Students are taught by experienced faculty, many whose expertise comes from years of professional experience and academic learning. Dedicated instructors and staff provide an environment that develops personal values, ethical practices, and social responsibility, while fostering an appreciation of diversity. The College's commitment to excellence and to the active participation of students in their education provides a foundation essential for lifelong learning. What are the top 3 things that students do for fun at The Illinois Institute of Art-Chicago? The three things that students do for fun at The Art Institutes is hang out in the student lounge, creat projects with other departments/ collaborate, and joining clubs. The average student pays $24,957 for tuition, fees, and other expenses, after grants and scholarships. Total stated tuition is $17,388, in-state and on-campus, before financial aid. Want more info about The Illinois Institute of Art-Chicago? Get free advice from education experts and Noodle community members.